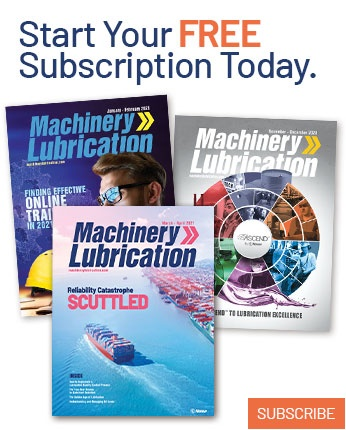 Has it ever occurred to you that it was necessary to specifically ask your OEM to add modern lubrication to the bill-of-material when you purchase equipment from him? Have you ever thought about selecting and specifying equipment based on life expectancy and life-cycle cost as opposed to just the initial cost? Maybe this is a more familiar scenario: Your OEM includes high-performance filters, breathers and modern sampling hardware as standard items on its equipment. Many purchasing agents earn bonuses based on their performance in driving down the cost of the equipment they purchase. However, these agents are never asked to pay back their bonuses when later this same equipment experiences high maintenance costs and frequent failures. A better purchasing strategy for companies is to minimize the life cycle cost of ownership. When you buy cheap you often are buying problems. Compounding the issue, once a lowest price specification is in place, companies tend to buy the same problems again and again. A similar scenario occurs when companies pretend to save money by buying lubricants from the lowest bidder. Some corporate buyers have even used Internet reverse-auctions to buy lubricants in a way similar to the way commodities are bought and sold. Like lubricants, it is not the initial cost of the equipment that matters but rather the life-cycle cost (operating costs, maintenance, energy consumption, etc.). Consider the breakdown of the typical life-cycle cost of a common centrifugal pump compared to what might be achieved if modern lubrication hardware and better seals were included (Table 1). In Table 1, modern lubrication and better seals result in an increase in the initial purchase price of $500. For people who buy equipment, this may seem rather unsavory and not the bargain they were hoping for. However, for those who view overall long-term business performance, it’s a financial windfall! Actually, more like the goose that laid the golden egg. Put in $500 today and five years later get $10,000 in return. This is equivalent to earning a compounded interest rate of 111 percent on a passbook savings account. The net present value on the $500 is approximately $7,727 based on a discount rate of five percent. Not bad! Put another way, for those who pretend to save money by buying equipment stripped to the bones: $500 saved is not $500 earned, but rather $7,727 forfeited, all for the quest of $500. Next, let’s talk about what it costs to buy equipment not properly equipped by the OEM for modern lubrication. When this happens, the maintenance staff is left with having to engineer, source, buy and retrofit the necessary hardware onsite. Now, back to the pump example and that initial cost increment of $500. This is what you pay when these parts are included in the original bill-of-material. When this same hardware is purchased and later retrofitted onsite, the cost can increase to $3,000 or higher. Why? Users are not equipment builders and don’t purchase in volume. Aftermarket parts can cost many times more than preassembled machines or systems, not to mention the assembly labor. Take for instance that centrifugal pump; it costs approximately 3.5 times more than a preassembled new pump when purchased piece-by-piece. Even more interesting is an automobile. Bought piece-by-piece, it costs 17 times more than an assembled one on the showroom floor. A machine can generate revenue only when it is operating. Increased uptime means the machine makes more widgets (BTUs, tons of steel, etc.). 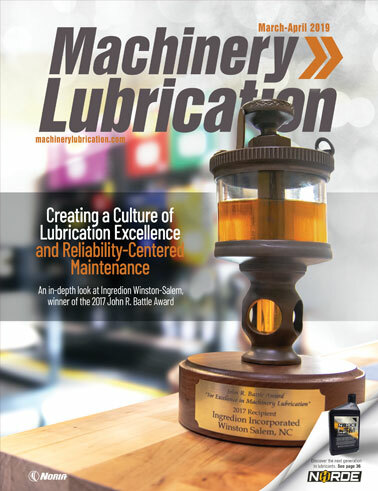 When lubrication is at best practice, machines are more productive and revenue increases. This includes energy, maintenance costs (repairs and PMs), spare parts, etc. 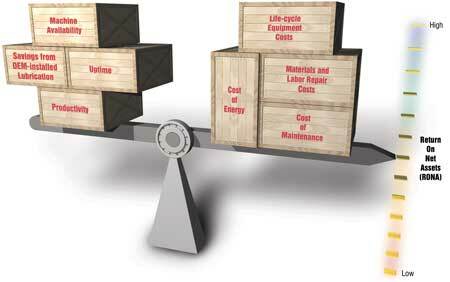 When lubrication is at best practice, expenses decrease. This is the cost of machinery and equipment, including modifications, less depreciation. When machines are accessorized for proper lubrication by the OEM and not by the maintenance staff, this decreases net assets. What’s interesting is that good lubrication practices affect all three parameters and in the right way: revenue increases, expenses decrease and factory-installed lubrication accessories reduce net assets. The collective effect is an increase in RONA, which is exactly what is desired. Level gauges - located near fill ports and large enough to easily determine oil level. Expanded-metal guards on chains, couplings, belts, etc. Sheet-metal guards restrict easy inspection of lube points and moving seal parts. BS&W bowl - bottom sediment and water (BS&W) sight glasses enable quick inspection of low-lying contaminants and sludge. Mag plugs - magnetic drain plugs and other magnetic inspection devices enable wear metals to be examined and removed from lubricating oil. Large reservoirs and sumps should be equipped with inspection hatches and should have lips, gaskets and compression clamps/ bolts to control accidental dirt entry, ingression (dirt, wash-down sprays, etc.) and air movement. Primary sampling ports/valves should be properly located and installed at the factory. Secondary sampling port/valves should be installed on many circulating systems. All circulating systems should have quality beta-rated oil filters at a capture size and efficiency consistent with contamination control objectives. High-performance breather should have capture size and efficiency consistent with contamination control objectives. Hydraulic cylinders should be equipped where practical with rod boots to control ingression. Reservoirs should have suitable baffling and be sized to enable contaminants to settle (dirt, water, sludge) and both air and gaseous contaminants to detrain. Dust protection covers should be installed where grease fittings are used. Off-line filter (kidney loop) should be installed on many bath/splash-lubricated machines. Headspace purge or other suitable headspace management equipment should be used with large reservoirs. Online oil properties sensors: viscosity, ferrous density, particle count, moisture, etc. Optimum selection of lubricant delivery devices based on equipment performance needs: drip, circulating, oil mist, splash oiled, constant-level oilers, single-point luber, grease fittings, centralized lube system, spray systems, etc. Optimum selection of seal type and quality for long-life service to control the ingress of contaminants and leakage. Use of temperature management systems, including heaters (start-up) and coolers as needed. Availability of grease purge ports where grease fittings are used. Proper selection of rolling-element bearing seals and shields. Proper use of lubricant return-line diffuser to control tank aeration. Installation of pre-lube system for engine cold-starts. Installation of power-flush quick- connects on tanks, reservoirs and sumps. Detailed and illustrated lubrication procedures (oil change, grease change, grease add, oil top-up, etc.). Detailed and illustrated flushing procedures and listing of suitable fluids for flushing. List of all lube points. Recommended lubricants (perform- ance specification) for all lube points and operating conditions (speeds, loads, etc.). Brand/type cross-reference for all lubricants. 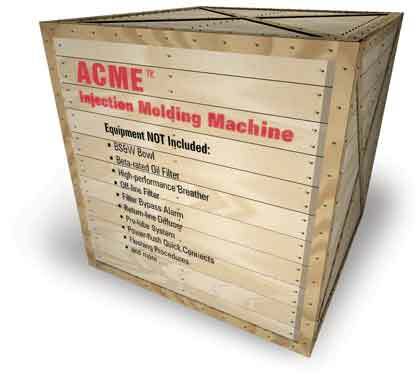 Equipment storage protection practices/products, including use of fogging agents, shaft extension sprays, breathers and vapor-phase rust inhibitors. Roll-off cleanliness of new equip- ment fluids/lubricants. Run-in procedures for gears and similar equipment. Seal compatibility information for system lubricants and other fluids. The best lubrication programs, often referred to as world-class, are those that have world-class lubrication technicians, use world-class lubricants and deploy world-class procedures. What must be included is the need for factory-installed world-class lubrication equipment and devices. It’s time to talk to your equipment supplier. Mackay, Ross. “Current Best Reliability and Maintenance Practices of Pumps and Pump Systems.” Results Oriented Reliability Maintenance Conference. Raleigh, N.C. November 2002.